I don’t get to Niles very often so I’m not very familiar with the restaurant scene. One day last week, I got sent to Niles for a task. My co-worker had called in sick so I was on my own and I kind of drove around aimlessly for a little while looking for something quick. I couldn’t find any sandwich shops or quick take-out spots and I was about to give up and just order something to go from one of the pubs. I probably should have just done that but then I noticed a rare fast-food chain in these neck of the woods. I was heading south on 11th Street when a somewhat familiar red and yellow sign caught my attention. Niles had a Hardee’s. 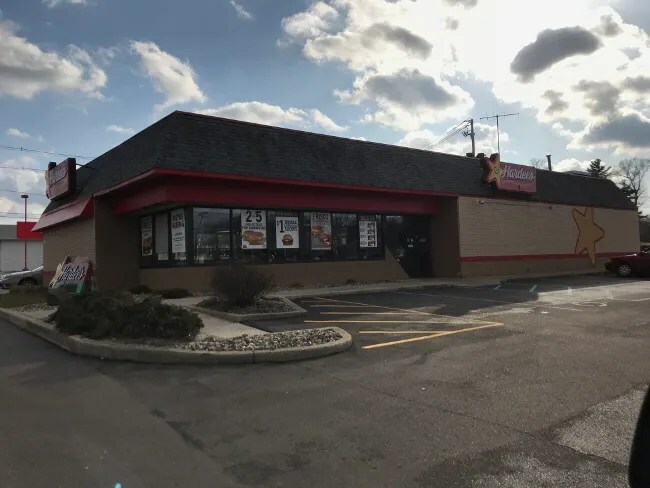 Hardee’s is on 11th Street, which is also M-51 at Silverbrook Avenue in Niles just south of the downtown just across the street from Thomas Memorial Stadium. The fast food restaurant is in the parking lot of a Martin’s Super Market. I have a weird history with Hardee’s. It’s always been my favorite fast food restaurant. 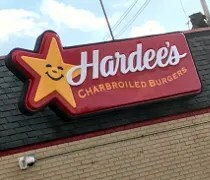 When I was growing up near Kankakee, IL there were several Hardee’s in the area. Slowly, over time, all of them closed. Hardee’s went through some things and there aren’t nearly as many stores as there were in the 1980’s and 90’s. I get a little too excited when I see one now just because it’s something I can’t get whenever I want like it used to be when I was growing up. Anytime I head east on I-94, I stop at the Hardee’s just outside Marshall. Heck, I’ve gone out of my way to stop at that one before. Hardee’s is really just like any other fast food restaurant. There’s an order counter in front of the kitchen with the menu boards hanging over head. 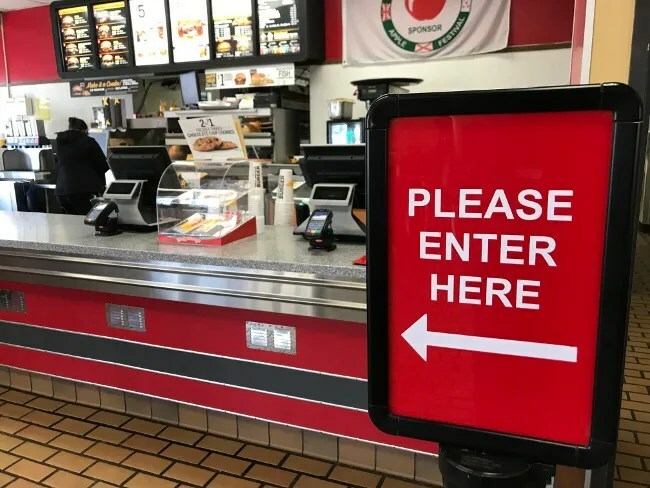 It’s a familiar set-up and one that has been around for many years in the fast food industry. There’s a dining room that takes up the rest of the space that looks like it’s only been slightly updated over the years to add the bolder red and yellow color scheme. 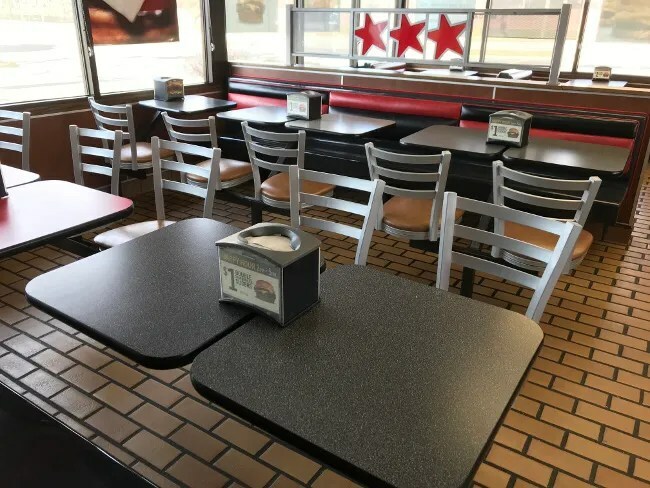 It has the same, old faux brick tile running through out that has been part of the Hardee’s look for years. Hardee’s isn’t really healthy food to begin with but I really splurge when I find a Hardee’s. They’ve always had a burger that was incredibly delicious although incredibly unhealthy. The 2/3lb. Monster Thickburger is a burger that lives up to it’s name. The two 1/3lb patties are separated by a layer of bacon and cheese with a little bit of mayonnaise on a fresh baked bun. This thing clocks in a gut busting 1300 calories with over 3000 mg of sodium…..but it’s sooooo good. 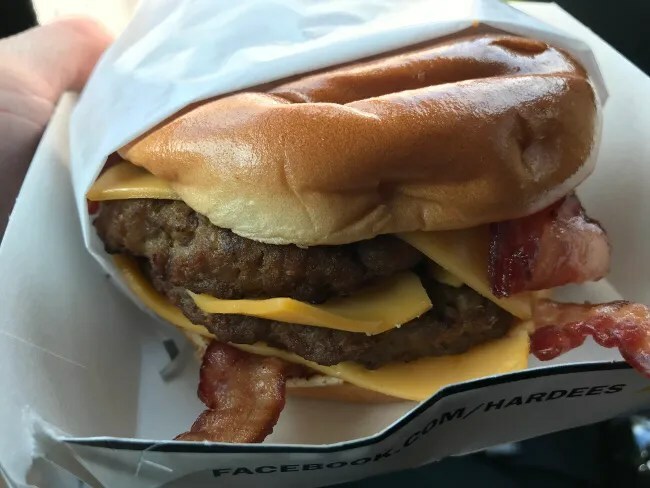 It’s not a burger I would eat everyday, obviously, but I get to Hardee’s so rarely I figure one’s not going to hurt me….right? Not that I needed anymore calories for the day, but I made the sandwich a combo and got a large Coke and a large order of fries as well. 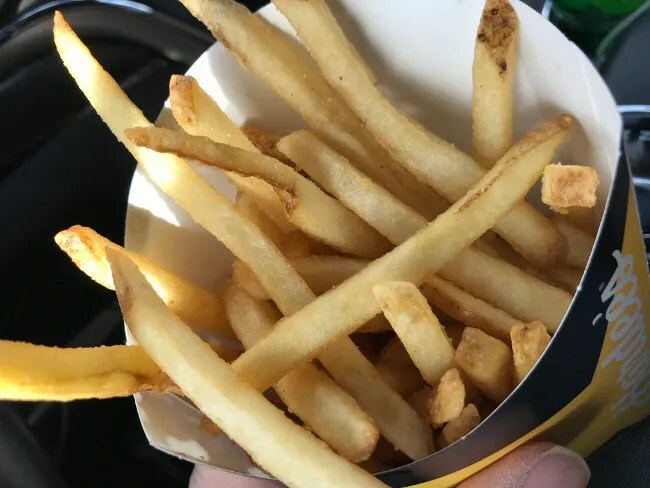 The fries are thin, salty, skin-on fries. They’re nothing to write home about but they are decent fast food fries. The fast food meal from Hardee’s set me back a little over nine bucks and I was able to eat it on my way back to Kalamazoo after completing my task in Niles. Let’s be honest, Hardee’s is fast food. It’s probably no better than any of the other fast food options but I have the option to get it so rarely that whenever I do it feels like a treat.